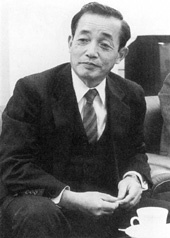 The unique shape of XA was designed by Yoshihisa Maitani. 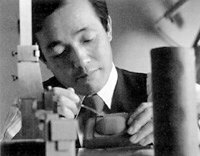 To make an ideal camera body, Maitani painstakingly worked on a clay model at his home till midnight. Working with a clay model involved making endless fine alternations and then gazing at it for a long time. When the clay model didn't look right however many alternation and retouching had been made, it was time to start afresh with a new model. 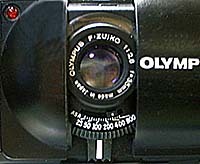 To design a lens that can be fitted to the compact dimension of the XA body was one of the hardest problem of the XA development. Maitani insisted on a 35mm lens to be fitted into a body of 4cm thick. However, only a 31mm wide angle lens can be fitted into it by using the conventional design concept. Moreover, by shortening a Tessar type 35mm lens, the maximum shortening achieved is 1mm and not the required 4mm. The lens design team headed by Yoshisada Hayamizu finally came up with the idea of using a "Reverse Retrofocus Type" or "Telephoto Type" lens design. It was the first time that a "Reverse Retrofocus Type" 35mm wide angle lens was designed. (Normally, this type of lens design was used to make telephoto lens for slr cameras.) 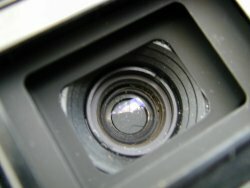 To provide focusing without extending the lens outward, an inner focusing mechanism was adopted. "X" and "A". "X" is the most distinctive sounding letter in the English alphabet, and it conveys a futuristic and leading- edge technology image. "A" was chosen for no particular reasons except it goes well with the "X" and it offers the nuances of "Number 1"
a special surface finish is applied to the body to give it a stone-like feel. The wide shutter speed range of XA (1/500 sec - 10 sec) called for a mechanism of unusually high precision. It was found that the magnet used for opening the shutter needed to be very small, reliable and durable. However, such kind of magnet could not be found in existing products. After consulting specialist magnet manufacturers one after another, a magnet made of rare earth material was found suitable. 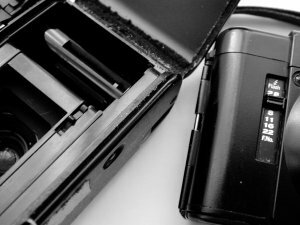 To minimize shake, a shutter release button that could response to the slightest touch was developed. A special pressure sensitive conductor element was used.